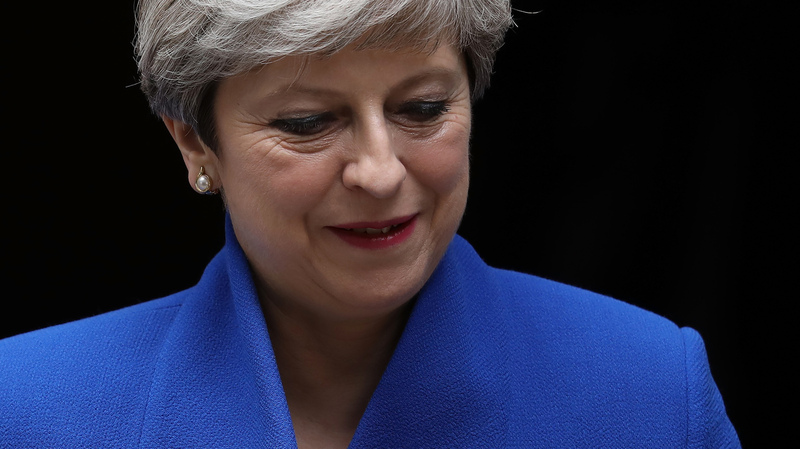 'Dead Woman Walking': Amid Election Fallout, Theresa May Stands On Shaky Ground : The Two-Way The British prime minister hopes to form a government with a small party in Northern Ireland. But members of her own party are questioning her leadership, and Labour leaders aren't ready to give up. Prime Minister Theresa May leaves the prime minister's residence on Friday. This weekend, she has been seeking the support of the Democratic Unionist Party to form a new government after a disappointing result for Conservatives in Thursday's election. Just over a week away from the formal start of Brexit negotiations, British Prime Minister Theresa May is scrambling to cobble together a new government in Westminster — and to maintain her own position in 10 Downing Street. The fallout from Thursday's snap general election, which left her Conservative Party bereft of their majority, also prompted her to seek out a relatively tiny ally that could have vast sway over what happens next in the U.K.
Reports surfaced Saturday that May was nearing a final deal to form a government with the help Democratic Unionist Party, a socially conservative, primarily Protestant bloc based in Northern Ireland. With just 10 members of Parliament, the DUP doesn't wield much power on its own — but those seats, if they vote with May's party, have the power to push the Conservatives over the threshold to a functioning government. Still, May's status remains shaky, at best, after the Conservatives' principal rival, the Labour Party, pulled off a dramatically positive showing at the ballot box Thursday. May had called the election to build upon her majority; instead, the party lost it. "Theresa May is a dead woman walking. It's just how long she's going to remain on death row," George Osborne, a former Conservative chancellor, tells the BBC. "I think we'll know very shortly. In other words, we could easily get to the middle of next week and it all collapses for her." "I think her position is, in the long term, untenable," another Conservative lawmaker, Anna Soubry, tells Sky News. "I just don't see how she can continue in any long-term way." Under pressure from Conservative cabinet ministers, May accepted the resignation of her two top aides, her co-chiefs of staff Nick Timothy and Fiona Hill, on Saturday. But for now, Foreign Secretary Boris Johnson says reports of a plot to remove May herself is "tripe." Meanwhile, Labour leader Jeremy Corbyn, fresh from his party's strong showing, continues to put pressure on the weakened Conservatives. His party "didn't win the election," Corbyn says, but he is prepared to continue resisting the Conservative agenda — especially what's known as "hard Brexit," a clean break with the European Union and departure from its single market system. 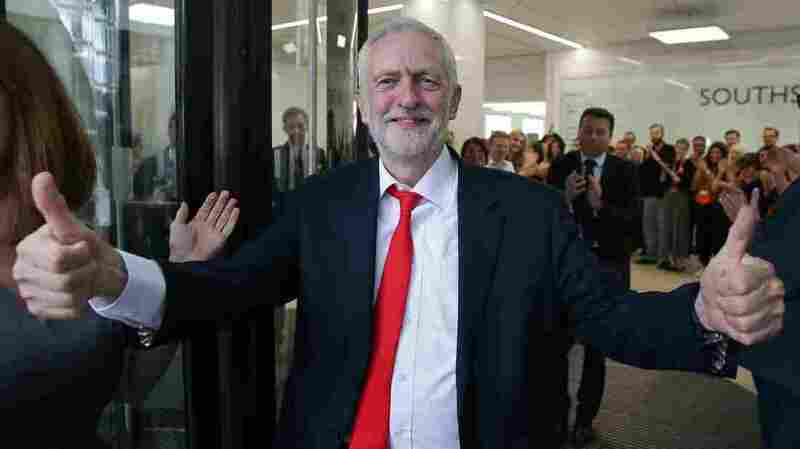 Labour leader Jeremy Corbyn gives a thumbs up as he arrives at the party's headquarters in London on Friday. Corbyn says he's prepared to keep up the pressure as Theresa May works to form a new government in the U.K.
"I can still be prime minister," Corbyn tells the Sunday Mirror. If a coalition of minority parties led by Labor effectively opposes May's government, a new election could be triggered. And recent polling shows Labour's popular momentum appears to be maintaining. "This is still on," Corbyn says. "Absolutely." The chaotic situation won't have long to settle: Formal Brexit negotiations with EU leaders kick off on June 19.